A 'keet who's 7 weeks old should be almost ready to leave the nest. If your parakeet pair are proud parents to a clutch of babies, providing for the brood will be your priority for the next few months. Parakeets are typically good mommies and daddies, feeding their little ones and keeping them warm until they're old enough to leave the nest. Baby parakeets hatch out of their eggs blind and naked, but they develop and mature fairly quickly. Over the course of the first two months of their lives baby 'keets grow feathers, open their eyes and start eating on their own. By the time a parakeet is 7 or 8 weeks old, he should be ready to leave Mom and Dad and go to a new home of his own. 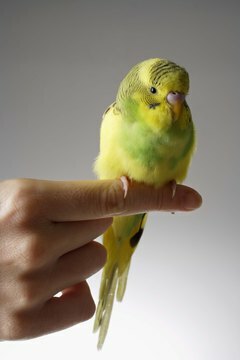 Hand-raised parakeets are sought after because they are used to being handled. They're not just tame, they actually enjoy interacting with their humans. Removing baby parakeets from their parents is a controversial but common practice to rear birds who aren't frightened or flighty and relate well to the humans who adopt them. Taking a baby bird away from his parents before he's ready isn't optimal for him, though. A solution aviculturists have come up with is co-parenting. It allows baby parakeets to remain with their natural parents during the first eight weeks of their lives, while humans lend a helping hand in occasional feedings. The babies are handled for at least five minutes each day but no longer than 15 minutes, including feeding times, to get the chicks used to being touched and picked up. Provide a comfortable home for your parakeet family while the little ones are maturing enough to leave their parents. Give your birds a proper nest that is concave, shaped to keep the eggs and eventually the babies together to make nesting easier on Mommy. Nesting material should be soft and clean. Pine shavings are ideal, as they are softer than pine chips and are non-toxic, unlike cedar shavings. Even if it's pine, avoid sawdust, as baby parakeets could breathe it into their tiny air sacs. Also provide soft food for the parents to feed to the babies. Cooked corn, rice and lentils with some mashed hard-boiled egg and bits of whole wheat bread will be nutritious and digestible for the babies until they are older and begin eating seed and other adult parakeet food. If your choice to co-parent your baby parakeets includes helping out during feedings before they're old enough to be away from their parents, consult with your avian vet on how to properly feed a newborn bird. Hand-feeding baby parakeets can be rewarding and may even be necessary in some circumstances, but there are risks involved. If you are inexperienced you could overfill your babies' crops, which could cause them to tear and become infected. You also might not know what problems to look for, like crop impaction, a slow emptying crop or a sour crop. In an article for Parrot-and-Conure-World.com, avian vet Greg Burkett describes hand-feeding as easy to do but not simple. Dr. Burkett recommends getting handwritten instructions in addition to being shown how to feed your babies and staying in contact with your vet at least until after the babies are weaned. How Old Should a Parakeet Be Before You Hand Feed Them?